For our longtime readers at STH, you will probably notice that one theme in our reviews, including our AMD EPYC 7351P Single Socket CPU Linux Benchmarks and Review is that AMD EPYC has done a great job providing many cores inexpensively. On the other hand, it often does so at a lower clock speed. That makes the AMD EPYC 7001 line more exciting for VMware and Linux shops or others with per-socket licensing, but less so for per-core licensing. 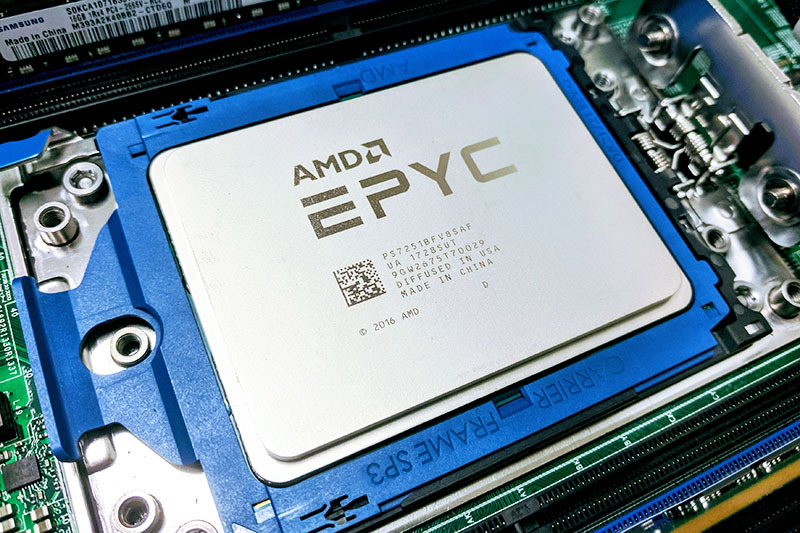 In 2019, we know that AMD EPYC 2 Rome Will Change the Game. In the interim, we have new extensions to the AMD EPYC 7001 line. One of those we highlighted was the AMD EPYC 7261 8 Core CPU. 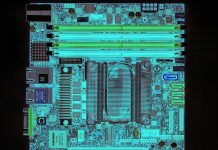 With Supercomputing 2018, we have the AMD EPYC 7371 launch of a frequency optimized SKU. We do not have full specs on the chip yet, however, what we do know is that the AMD EPYC 7371 has 16 cores and 32 threads. Since this is a “73×1” part, we expect that it will also have 64MB L3 cache. Clock speeds are much higher. The AMD EPYC 7351P featured a 2.4GHz base and 2.9GHz turbo clock with a 170W TDP. AMD announced that the AMD EPYC 7371 will have a 3.1 GHz base frequency, with a 3.6GHz all core boost frequency and a 3.8GHz max boost frequency for eight cores. That is a 700MHz+ upgrade over the AMD EPYC 7351 and 7351P. For those who wanted higher frequency AMD EPYC SKUs, this is it. Since this is not listed as a “P” SKU, we expect it to be dual socket capable. 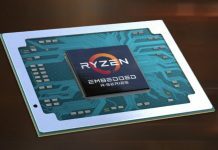 AMD did not give out the official TDP, but it is reasonable to assume that increasing clock speed by 700MHz will yield more power. The AMD SP3 socket has plenty of thermal headroom for higher-power processors. We are happy that AMD is moving into a frequency optimized direction and expect that it will be more of a focus with the upcoming Rome generation. We first got wind of the AMD EPYC 7371 AMD Next Horizon Event and already requested a sample to add to our expansive data set. Stay tuned for performance numbers. We have plenty of AMD EPYC sockets waiting for this new and exciting SKU. AMD says it will be available in Q1 2019. EPYC 7371 (16 cores, 3.1 GHz base) in 2019Q1 vs. the current 7351 (16 cores, 2.4 GHz base), >25% increase! @Wow&Wow – not necessarily. The Threadripper 1950X had higher clock speeds (3.4GHz base) on the original 14nm node in a 180W “TDP”. It didn’t, of course have as many interconnects or memory channels but given the maturity of the manufacturing, I’d expect the 3.1GHz base to be reasonably easy to hit with the 14nm Zen 1 architecture. It’ll also be interesting to see how it compares to the 24 core EPYC 7401 (2.0GHz base; 2.6Ghz all core) CPU from a general performance perspective. A simple straight cores x base frequency calculation has the new 7371 ahead for raw compute at base frequencies (49.8GHz vs 48GHz) while providing better single threaded/best case performance. And the 7371 not too far behind at the maximum all core turbo frequencies (57.6GHz vs 67.2GHz). If priced similarly, I can’t imagine there being too many workflows that’d perform better with the 7401. This is the single cpu all the small Windows shops have been waiting for! Microsoft changed their licensing just in time to cut the legs out from small business servers and beg for an extra buck… Jokes on them, open source is HUGE now! 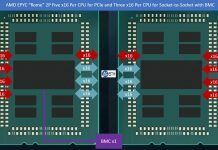 Will we see Epyc Rome 12 colors 3GHz base 4GHz turbo?